When Google Wallet was introduced, I described Wallet as "Google Checkout's extension to offline payments". 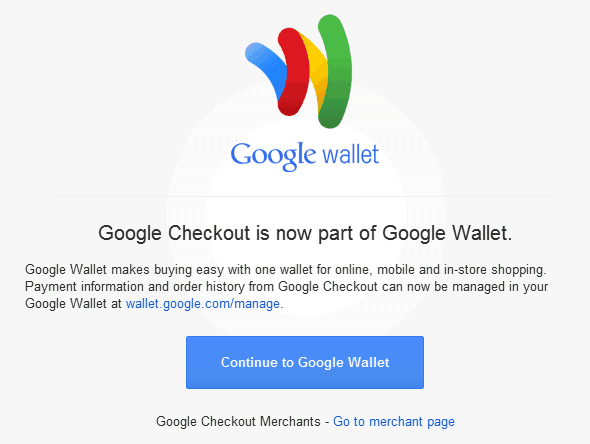 Now Google Checkout is transitioning to Google Wallet and Google will no longer have two payment services. "We're starting to take all the great functionality and ease-of-use you've come to know with Google Checkout and merge it with Google Wallet to create a single wallet, whether you're buying online or in-store. We're also starting to integrate Google Wallet as the payment method on Android Market, YouTube, Google+ Games and many other Google sites." If you already use Google Checkout, the site will redirect you to wallet.google.com, where you can manage your transactions and payment methods. Google Checkout is now known as the Google Wallet Online Service, "a free service that lets you carry your wallet on the web". Not all the sellers will use the new name right away, so you'll still see Checkout's logo in many sites. For now, the offline Google Wallet only works in the US and the Android app is only available if you buy a Sprint Nexus S 4G phone. "Our goal is to make it possible for you to add all of your payment cards to Google Wallet, so you can say goodbye to even the biggest traditional wallets. This is still just the beginning and while we're excited about this first step, we look forward to bringing Google Wallet to more phones in the future," said Google back in September, when Google Wallet was launched. i hope the day wallet is better than paypal. I would be more impressed if Wallet wasn't so limited to device and bank. Right now it is not viable at all for most people since you must own a certain phone and use a certain bank. Not a viable option at all. Good idea, but waaaay too limited. It's a good merger, although one thing that I've noticed is that it lacks flexibility when it comes to kinds of transaction. But knowing Google, they will eventually upgrade their service and make it one of the best. They always manage to do so. One thing I've learned about Google over the past decade or so, expect many upgrades to come. What do you think Google's long term plans are with wallet. I have Google checkout working on my site because i didn't like pay-pall. But it looks like now ill have to go to google wallet.